Keeping your flag lit at night is a beautiful way to honor our country and maintain your patriotic spirit. It’s also suggested by the United States Flag Code to either illuminate your flag or lower it at sunset. At the United States Flag Store, we have a variety of flag pole lights to choose from. 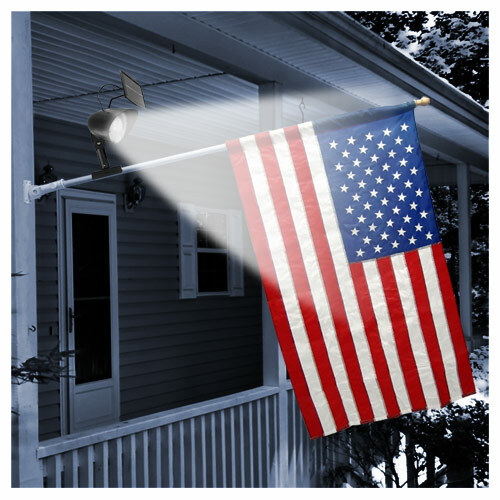 One type of light that will keep your flag illuminated but is energy-efficient and won’t bump up your electric bill is a solar flag pole light. We have a great selection of these lights, all available at unbeatable prices. They make great Father’s Day gifts, too, so read on to learn more about these fantastic products. Our basic Solar Flag Pole Light is designed to automatically take care of keeping your flag illuminated without any hassle on your part. This solar light does not require any wiring and it’s easy to install. With an automatic on and off switch, you can control the time your flag pole light turns on, but still receive the benefits of the light absorbing energy from the sun during the day. Overall, this flag pole light is safe, easy, and very affordable. Order one today for only $42.99, a savings of nearly $23 off the list price! The FlagZone Residential Solar Flag Pole Light is the perfect solar light option for customers who are looking for a light that will fit a smaller flag pole. This light is designed to fit flag poles that are between 0.75 inches and 1.25 inches in diameter and 5 feet to 7 feet in length. This solar light does not require any wiring but it absorb energy from the sun with a 0.8W solar panel and shines with a 25 LUX, high-intensity LED light. This light also looks great, with a glossy black finish and waterproof lens and gasket. Order one of these great lights today for only $18.99, a savings of $7 off the list price!